After the sesquicentennial celebration in 1953, interest in Worthington’s historic landmarks remained high. 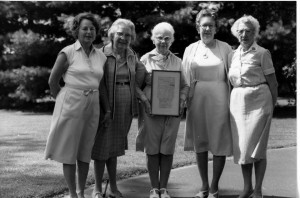 Subsequently, on April 28, 1955, eight women initiated the founding of the Worthington Historical Society by organizing a historical study group within the Worthington Women’s Club. The group disassociated itself from the Women’s Club on June 30 of the same year to become the Worthington Historical Society. The slate of officers, along with the constitution and by-laws, were approved on July 28, 1955, the accepted organizational date of the Society. Sharon Township Trustees had made museum space available in the old Sharon Memorial Hall, 137 East Granville Road, and on October 9, the opening of the Society’s first museum took place. the now well-established Third Grade Weeks. until October 31, 1969, when it became necessary to put all available resources into the restoration of the Society’s acquisition, the Orange Johnson House, located at 956 High Street, Worthington, Ohio. On January 25, 1963, the Society was able to purchase the historic Orange Johnson House from the condominium developers of Toll Gate Square. This stately, early-Ohio brick house was destined to remain a part of the Worthington scene and, because of the hard work and dedication of so many people, it stands proudly today as a living museum. The house offers an enjoyable way to study our pioneer history due to the fine restoration and numerous activities held throughout the house and garden. Craft demonstrations have included candle-dipping, bread-baking, book-binding and broom-making. The drawing room, used frequently for concerts, features a rare German piano made around 1800. The Christmas Open House has become a beloved tradition with special children’s Christmas programs held three evenings in December, for third through fifth graders. The first part of the restoration, the pioneer east wing (1811) was accomplished by July of 1969. With the completed restoration, the house was formally dedicated and opened to the public October 7, 1972, having the distinction of being the only pioneer home to be completely restored on its original site in Franklin County. Another milestone was reached on April 6, 1973, with the burning of the house mortgage. On October 2, 1974, the Society accepted the Indian Mound on Plesenton Drive from a revised deed of the Jeffers’ Trust. The site has been made available to The Ohio State University for archaeological excavations. The Episcopal Rectory, now known as the Old Rectory, was saved by the Society from demolition and was moved from 799 Hartford Street on the night of July 7, 1978. Relocated at 50 West New England Avenue, the building houses the Doll Museum, the Shop at the Old Rectory, the Society’s library, offices, collections and special exhibits. It also provides space for educational and community events. The Society’s long success can be greatly credited to the perseverance of many individuals and to the birth of Study Groups in February, 1956. They became the supporting arms of the Society, reaching 20 in number by 1975, creating an invaluable, large volunteer force unique in the history of historical societies. The Worthington Historical Society is dedicated to creating experiences that inspire and promote public interest in Worthington’s history. To maintain Worthington’s legacy for future generations, the Society will preserve and interpret its properties and collections and provide educational opportunities to the community. The Worthington Historical Society (WHS) in Ohio was founded in 1955 by Worthington citizens in order to preserve the history and heritage of the community. Properties such as the Orange Johnson House, the Old Rectory, and other acquisitions, were made through donations from the community, and are being maintained by the Society for the benefit of the community and all those who come to visit. Throughout the last fifty years, the WHS has operated with the help of private contributions, membership dues and Society projects. Since 1994 the WHS has received grants for educational programs and activities from the City of Worthington. The mainstay of the Society’s existence has been its many dedicated volunteers. The Society has made every effort to maintain the New England atmosphere which has remained a symbol of “Old Worthington’s” heritage. Can’t find who you are looking for? Contact us at info@worthingtonhistory.org and we will make sure your inquiry is directed to the appropriate party. All phone calls and mail should be directed to our administrative office at the Old Rectory.